The Pitchfork 500, subtitled “Our Guide to the Greatest Songs from Punk to the Present,” is an excellent example of the upstart music criticism website using its powers for good, not for evil. Covering the period from 1977 to 2006 (with a few late-breaking tracks from 2007 snuck in, including z=z fave “All My Friends“), the book presents capsule reviews of each of the chosen songs. As lists go, five hundred is quite large enough to include many songs that you’d agree with, and as well as bunch that you wouldn’t, and some of the choices were surprising but inspired – for instance, Duran Duran get Rio‘s tense and disturbing closer “The Chauffeur” and not either of the megahits, “Hungry Like the Wolf” or the title track.) Unsurprisingly, the list is a bit American-centric (the omission that jumped out at me was the band Squeeze, who were much bigger in the UK and Canada than in the US). But the beauty of the format is that the writers get to enthuse about the songs they love – even a casual perusal of the book rewards with a new appreciation of songs that you’re familiar with, and an urge to go and search out the unfamiliar ones. 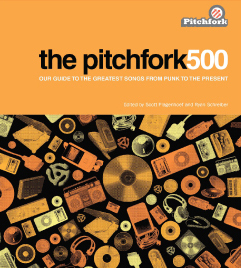 Being Pitchfork, they couldn’t quite leave out the snark entirely, and the book is peppered with sidebars focusing on specific genres, ranging from grime to ‘post-Fugazi emo,’ to ‘yacht rock’ (yes, songs about sailing). I like when Pitchfork is snarky because otherwise they’re taking themselves way too seriously…I mean, honestly, they review music. But then again, you could also make the claim that they help shape scenes, which down the road will be important for other reviewers and critics to note and draw on to shape the scene of their day. Now I’ve got myself all confused. I have to say, I love it when Pitchfork brings the snark because it is fun reading. If you’re going to say negative things (and as music critics, they will, at least sometimes), they should at least be amusing to readers. I’m glad you read this to tell me it’s pretty good. I definitely would never have picked it up on my own but now you’ve made me a bit curious. Yacht rock is totally legit. In fact, my band once covered Sailing by Christopher Cross (yacht rock in its most pure form) at an MIT regatta we were hired to play last summer. Also, Steely Dan’s Any Major Dude Will Tell You is one of my all-time favorite songs. Nick, doing a cover of “Sailing” for a regatta seems like an admirable example of knowing your audience. And yes, that David Cross post is excellent.